If for some reason you’re in the mood for a version of the Nativity this Christmas that isn’t performed by your young children in a school assembly, then maybe The Star will satisfy your odd cravings – but for everyone else, this is a harmless but hilariously lame attempt to give a whole new spin on a story that everybody far and wide knows almost off by heart. It is essentially the story of the very first Christmas, complete with Baby Jesus being born in a stable, the shepherds and the Three Wise Men et al, but told almost exclusively from the point of view of the animals; so, it’s basically that time-old story that’s interrupted every now and then with cartoon slapstick involving animals doing the craziest things. Primarily, we follow a donkey named Bo (Steven Yeun) and his dove friend Dave (a remarkably unfunny Keegan-Michael Key) who, in their attempts to join the “Royal Caravan” – an unexplained fancy caravan presumably of the royal variety – come across the likes of Mary (Gina Rodriguez) and Joseph (Zachary Levi), who are of course expecting a certain bundle of joy. As they assist them on getting to Bethlehem, they try and stop a henchman of King Herod (Christopher Plummer) from stopping the new King from being born, and also come across some other animals along the way, including three camels (Tracy Morgan, Tyler Perry and Oprah Winfrey) who are carrying the Three Wise Men across the desert. Since this is meant to be a family-friendly cartoon, albeit more so for kids rather than adults, the movie never goes into some of the more graphic sides to the Nativity story, such as King Herod’s ordering of many innocents to be slaughtered in his hunt for the actual Baby Jesus. These sidesteps make the film an unintentionally funny watch, especially if you know the whole story and not just the basic facts; every moment something heartwarming happens, all you’re thinking in your head is how somewhere else, King Herod is, as one of the camels puts it, “up to something” that’s far less appropriate for children. It’s probably the only part in your head you’ll find entertaining about the film, which sets out to do exactly what it was mandated to do and nothing more, which is to provide a cutesy and inoffensive retelling of the Nativity meant to be shown in Sunday schools instead of being in cinemas nationwide. However, for adults it will probably be a groan-inducing experience because, aside from the pre-school level of humour and extraordinarily thin plot and characters – outside of what is necessary for this particular story – there’s nothing to really latch onto to give you either a spiritual experience or a meaningful slice of Christian entertainment. It just feels like one of those films that an RE teacher around Christmas time would put in front of their class just to get them to be quiet for the next hour or so while they just chill at their desk, which for a pre-school age class is perfectly fine – after all, it’s pretty harmless and doesn’t contain anything offensive, which given the likes of other religious films out there like God’s Not Dead or War Room is remarkably sad that there needs to be clarification that a faith-based movie like this is harmless – but for anyone older they would consider it a lame waste of time. Filmmaking-wise, it’s competent enough, but thoroughly unimpressive; the sub-par animation makes one wonder if this would have fared better as a direct-to-DVD feature instead of a theatrical one, but it probably ended up as it did because of its ridiculously sized voice cast. Some of these names feel like they were par for the course, like Gabriel Iglesias or Kelly Clarkson, but then there’s far bigger names like Christopher Plummer, Oprah Winfrey, and even Kris Kristofferson (who, by the way, sounds like he probably wanted to be anywhere except the recording booth), many of whom aren’t even there for that long, so why on Earth would you get such big names for this disposable animated feature in the first place? Unless you’ve got really, REALLY little children to look after for the day, I guess this is okay to go along and watch, but even then just take them to something far more wholesome like Paddington 2; or if it’s something more Nativity-centric you’re after, just wait to see them perform in their Christmas school assembly – you’re guaranteed to get a lot more genuine smiles out of that than with The Star and its endless lameness factor. 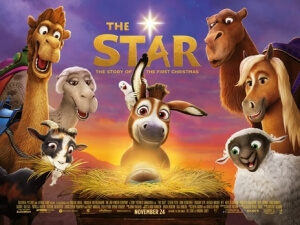 The Star is a hilariously lame animated family adventure that certainly has good intentions, what with its harmless retelling of the Nativity from the animals’ perspective, but never transcends beyond what it was originally mandated to do, delivering pre-school level humour and a mostly-wasted A-list voice cast that hardly any adults will get any kind of joy out of.